If you haven't already heard of this company, allow us to introduce you to 31 Bits. 31 Bits sells jewelry and all of the pieces are made out of 100% recycled paper, by some amazing ladies in Northern Uganda. They were so kind and sent us some pieces which you can check out below. I'm wearing Canopy/$38 and Casey's arm is wearing Rosebury/$24. Head over to their website and check out all the great pieces in their new "House of Rhythm" line for Winter. 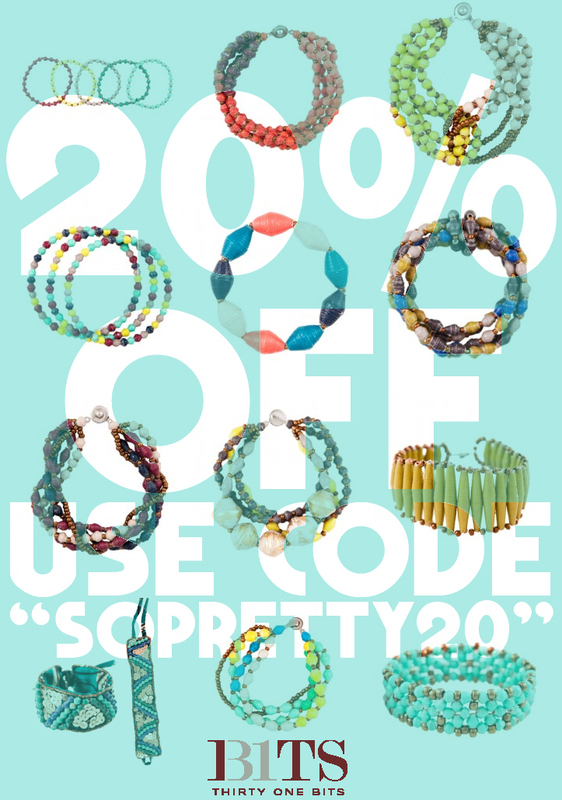 If you feel like buying something, you can use the code "SOPRETTY20" to get 20% off! The code is good from Oct. 1- Oct. 7. Love 31 Bits! Thanks for the promo code- I'll most definitely be using it! Oh those are so pretty. Definitely will be checking them out.